Welcome to Sona Flex Industries. Manufacturer & Exporter of T-Shirt Type Printed Carry Bags. The company was established in 2003 at Vadodara. Our well equipped infrastructure unit & customer focused approach have helped us to gain market across Europe, Africa & other countries. Excellent pre delivery inspection, voluminous warehousing facility & expert workforce have helped us to gain clientele like Metro Agency, G.L Packaging, Raja Plastic & other companies. 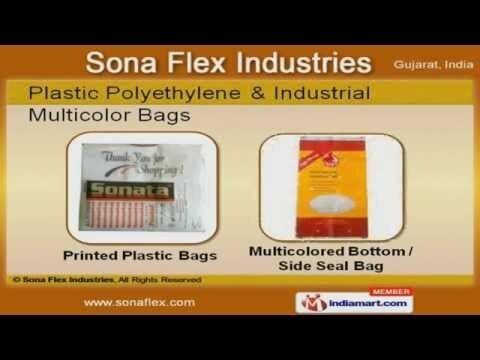 We are engaged in offering Plastic Polyethylene, Industrial Multicolor, Printed D-Cut & Mono filament Bags. Our Plastic Polyethylene & Industrial Multicolor Bags are a class apart. We are specialized in offering Printed D-Cut & Monofilament Bags. Our T-Shirt Type Printed Carry Bags are widely acclaimed in the market. Along with that we offer HDPE / PP Laminated Woven Bags at market leading prices. Vegetable and Fruit Mesh Leno Bags are some of our best selling products.